with Michael Franti who postponed surgery to perform at fundraiser. Proving that the human spirit is an unstoppable force, internationally recognized singer-songwriter Michael Franti downplayed a serious knee injury to put on an energy-filled musical fundraiser event for Highland Park-based Friends United for Juvenile Diabetes Research on Thursday, January 29th. Held at Metro Chicago in Wrigleyville, the concert event was a huge success grossing over $245,000 to help fund research aimed at significantly improving the lives of people with juvenile diabetes and eventually, eliminating the disease through a cure. Despite suffering a torn meniscus two days prior to the scheduled event, the San Francisco-based musician and philanthropist postponed surgery rather than cancel the show and flew into Chicago in the wee hours of the morning, along with two members from his band Spearhead. Once on stage, he didn't let crutches slow him down or dampen his enthusiasm for performing, as he raised the roof at one of Chicago's well-known live stage venues. "This event was really a dream come true with around 450 people of all ages laughing, mingling, eating, and dancing. Michael made a very big event seem like an intimate gathering and everyone left feeling they weren't at a charity event, but an experience," said Highland Park's Franny Zucker who co-chaired the event with her husband Michael. "The work, effort and positive thinking that went into making this event a reality is a reminder of what is possible and that one day soon, a cure will also be a reality." Franti met with a crowd of attendees prior to the show and recalled many of their names during his packed-house performance. He welcomed dozens to join him on stage and shared his personal story of being adopted and lovingly raised in an atypical household. He captured the hearts of the audience when he shared the difficulty of having his own 15-year old son recently diagnosed with a kidney disease. Another meaningful moment was his personal advice to the kids about not being judgmental or ever giving up on their dreams. 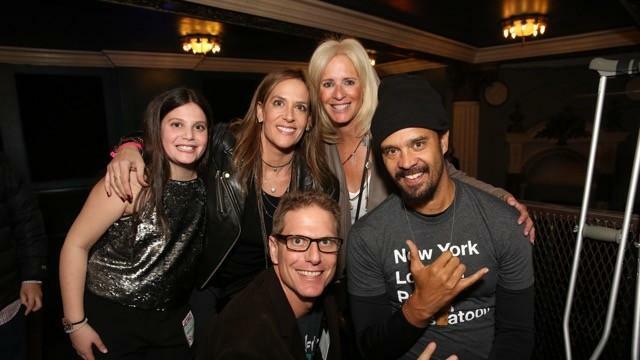 "Michael Franti really came through for us by refusing to cancel, knowing the importance of our cause," said Friends United's Co-President Susie Mandell, who founded the organization 15 years ago with a small group of friends and family who shared a personal connection to diabetes and an unwavering commitment to finding a cure. "This wasn't just a concert that could be rescheduled anytime; it was an event with the potential to help make life better for the millions of people with Type 1 diabetes." Like others who attended the event, Friends United Event Co-Chair Michael Zucker was absolutely wowed by Franti's uplifting music and boundless energy. "We're big Franti fans because of the music, poetry and the messages of kindness, peace and hope that he spreads," said Michael Zucker. "We have supported Friends United for many years, but when our daughter was diagnosed in 2013, we developed a deeper passion. We wanted to do everything to make this Friends United fundraiser an unforgettable experience!" Michael Franti is recognized by many as one of the most positive socially-conscious artists in music today. Franti and his fiancé, Sara Agah, started "Do it For The Love", a global wish-granting foundation that provides people living with life-threatening illnesses, children with severe challenges, and wounded veterans the healing power of music through live concert experiences. Proceeds raised at the concert fundraiser will go to support the groundbreaking research being done at the University of Chicago's Kovler Diabetes Center and additional cutting-edge research programs across the nation. For a listing of all the generous donors who made this event possible, please visit Friends United's website. Friends United is a 501(c)(3) non-profit, grassroots organization that began as a small group of volunteers, most from Chicago and surrounding suburbs, with a clear mission - to help fund research that will significantly improve the lives of people with juvenile diabetes and eliminate the disease through a cure. For more information and to learn how you can make a difference, visit friends-united.org/how-we-help.html. Do It For The LOVE Foundation is a 501(c)(3) wish-granting organization gifting people who are living with advanced stages of life threatening illnesses live concert experiences and meet-and-greets with their favorite artists. They are a network of heart-first artists and promoters dedicated to rocking out, bringing joy, healing and hope, and an unforgettable experience of celebrating life. Together with their loved ones, they can be transported to the show, meet musical artists that have inspired and touched their lives as they laugh, dance, sing and celebrate life. For details on how to participate in helping bring the healing power of music to as many people as possible, visit DoItForTheLove.org.